1.15kg topside dry aged hung 6 weeks – as much fat as possible on the meat. 2.875g Cure 1 – Pure Potassium Nitrate. 35g Sea Salt – Coarse Grain. 1 tablespoon of coriander seeds coarsely cracked. 1 tablespoon of black pepper coarsely cracked. 1 teaspoon of medium sweet smoked paprika. 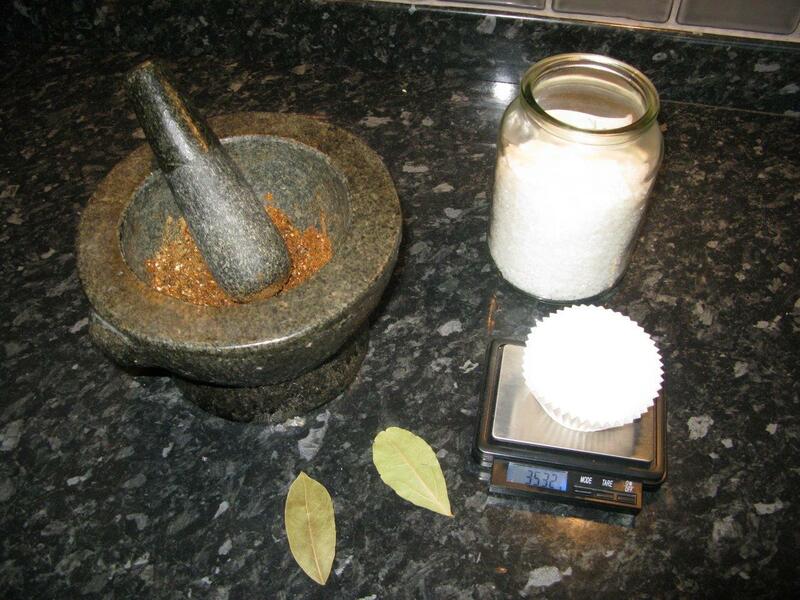 Mix all the dry ingredients measuring the Cure 1 exactly with 0.01g precision scales. Put all the mixture on the meat and quickly shake all over, then vacuum and seal the bag. Leave for 12 hours then turn over and redistribute the cure. Turn every day and massage for 10 days. After 10 days remove the vacuum bag and wash over, then soak for 30 mins in cold water. Dry off in the fridge for 2 hours then rub all over with lard. Roast at 210C for 20mins, then 50 at 160C. Then check temperature of meat with thermometer, it should be at least 67C. Leave to rest for 25mintes with some loose foil around it. Discard any salty juices and carve thinly. Nice on some homemade bread, with mustard and a gerkin! NB: You may find that the cure struggles to penetrate right to the centre and a very small grey patch is left, this is ok. The only way to avoid this is to make a small brine solution and inject into the centre of the meat at the start with small hypodermic. Tricky and messy but a better aesthetic look. Also you can try same cure with a thinner brisket (not rolled) this allows cure to penetrate more evenly.